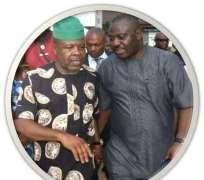 Group Congratulates Ihedioha & Irona ...declares victory as thepeople's verdict. ...declares victory as the people's verdict. A group under the aegis, Imo Liberation Movement have congratulated the Imo state governor-elect, His Excellency, Rt Hon Emeka Ihedioha of the Peoples Democratic Party PDP over his resounding victory at the 9th March, 2019 Governorship election in Imo State. In a congratulatory message signed by the Director General of the group, Emeka Nwokeke, the Secretary, Allwell Okorocha and the Director of Strategy, Dr M.N. Obasi extolled the qualities of Rt Hon Ihedioha who they described as a God fearing man and the choice of the people being the most experienced and qualified person to bring about good governance to the people of Imo State. According to them Rt Hon Ihedioha is more prepared politically than all the top contenders that contested with him. To them Hon Ihedioha has made mark as a political colossus with an overwhelming capacity to deliver people-oriented programs as well as better policy for durable socio economic developments, having been tested and trusted as a frontline legislator and having been the number six person in the country. They expressed the hope that with his wealth of experience and connection as a refined technocrat, he will bring his knowledge to bear in the liberation of the people from the present terible economic situation of the state by doing the needful. They described his victory as a divine intervention by God Almighty in which the people's verdict over ruled in the scheme of things against a minority evil group holding the people down for past eight years. The group equally thanked Independent National Electoral Commission, INEC and security agencies in the state for living up to expectations by ensuring that people votes counted. They therefore charged the governor-elect to pursue only people oriented programmes vigouriously as contained in the "electoral manifesto" to bring about radical change and transformation to Imo dwindling economy. They opined that the contents of the manifesto is rich and if applied will putting smiles on the faces of our helpless Imo people who had suffered so much as a result of Governor Okorocha's maladministration they alluded.